The free breakfast was very good as there was a good selection of Belgian waffles, biscuits and gravy, sausage, eggs, cereal, fruit, etc. Short drive to Lambeau field, home of the Green Bay Packers football team! Free wifi along with available upgrade. Great hotel, great location, wonderful staff, close to Lambeau field and the Bay! Enjoyed my stay thoroughly! Free parking spots as well as a pool and a gym . On Monday, the day after the game, we went back to Lambeau Field and took a great stadium tour there and spent a long time in the Packers Hall of Fame. This place was super clean, very friendly, with a great free breakfast. The hotel was very easy to find, and convenient to many destinations, such as Lambeau Field, downtown Green Bay, and numerous dining locations. 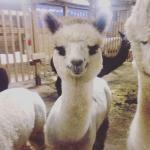 Get quick answers from Sabamba Alpaca Ranch and Bed & Breakfast staff and past guests.